OK, time for another review! This time it is on a Wii title that I was willing to pass on when I first heard about it, as it didn't exactly sound like my thing. The more I saw of it however, the more curious I became, and by the time it was announced for European audiences by publisher NIS America, I was curious enough to want to pick it up. I had read a few reviews and heard positive things about it, so what did my experience of this first of the series to be brought outside of Japan turn out to be? Well, I was pleasantly surprised by this light hearted strategy rpg that is as full of anime cliches as it is cheese and mechs. For my first experience of the series, I was very satisfied and in future would definitely pick up other games in the series if they are ever readily available in English. Importing the titles for me isn't that appealing. Not because I am afraid I wouldn't like the games, its just down to the amount of dialogue and text that would be a bit of a barrier to enjoying the games. My Japanese is only the most basic understanding, so I would need to use a guide for understanding the stories. Before I start, I should note that this review is for the Wii version of the game, as we didn't get the PS2 version over here in Europe. I'll try and keep this review spoiler free as well. The story takes part in an alternate universe full of steampunk mechs and strangely advanced technology, this really got me interested in the game, but unfortunately wasn't utilised as well as it could have been, apart from the mechs and some other technology. More emphasis seems to fall on the characters and how they interact with each other. The story follows Shinjiro Taiga, an ensign that travels to 1920s New York to lead a fighting troupe disguised as a musical troupe to defeat an evil warlord and his subordinates from conquering America as its kingdom. Yeah, it sounds like something from Power Rangers or some ridiculous anime and at times it basically is. If you go into this expecting a deep, dark, serious story you will probably be dissapointed. Or at least, you won't get that, but hopefully you will enjoy it regardless. I had a lot of fun with it. The characters are probably where the focus of the game lies. The amount of dialogue and character building throughout this relatively short (20 or 30 hrs) RPG is quite impressive. Shinjiro is at first not taken seriously by the rest of the squad. He came over to America in place of his father or uncle, who was some kind of legend in the military. So he has to prove himself worthy, and does so slowly throughout the game. Within the game, of the 8 chapters, there are 5 or 6 which are mainly devoted to telling backstory of one of the other girls in the squad as they either join the squad or have some problem that needs to be solved. Through these chapters, you learn more about the character's past and it uncovers a lot about them. A very cheerful cowgirl who tends to be a bit clumsy. Her master's last words bring her from Texas to New York with her horse, Larry(?!). She is very interested in Japanese culture and tends to daydream often. A strong-willed lawyer who practices out of Harlem. She is very intelligent and is recognized for her exceptional perseverance, toughness, independence and confidence. She serves as a sub-antagonist in Episode 2 as she works with Steam Frontier to demolish her hometown of Harlem. After facing her in a mock trial, Shinjiro helps remind her why she studied law in the first place and becomes closer with him. A Mexican markswoman and bounty hunter despite being only 11 years old. She is very energetic with an abundant appetite and obsession with food. A local birdwatcher who is incredibly compassionate. She is a doctor in training who has initially given up all hope to live until Shinjiro comes and gives her the hope she needed to keep going, despite everything she's been through. Subaru's true gender and age are completely unknown, though the character tends to use pronouns such as "herself" when speaking in the third person. However, Subaru is definitely a noble from a Japanese family and excels at Noh and other traditional Japanese dances. 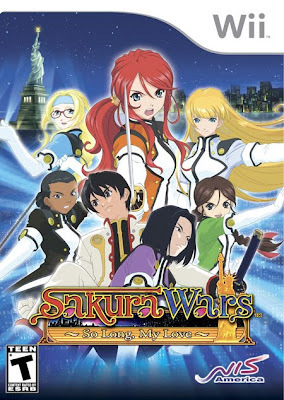 There are a few supporting characters in Sakura Wars: So Long, My Love include Ratchet Altair, a former captain of the European Star Division and captain of New York's Fighting Troupe until Shinjiro replaces her, she becomes the vice-commander soon after; Michael Sunnyside, the commander of the Star Division; Cherry Cocker (Plum Spaniel in the Japanese version) and Anri Yoshino of the Rainbow Division, who help the Star Division in battles; Yuichi Kayama of the Moon Division, who owns a Romando shop; and Xingzhi Wong (Gyouchi Oh in the Japanese language version), who is the designer of the STARs and owns a Chinese restaurant. Unfortunately, many of these supporting characters aren't developed as much as they could have been I felt. Yuichi, for example, remains way too mysterious. You might be able to tell from these characters that the game has an intensely Japanese feel to it, and you would be correct on that. Despite being set in America, the Japanese culture seems to be deeply ingrained in the game. I found that strange at times but appreciated it as we don't get many games like this. The characters are very strong and over the top and really make this game succeed in my opinion. In Sakura Wars: So Long My Love, the gameplay is split into two sections-Adventure Mode and Battle Mode. Adventure mode is where you will spend time with the other characters, talk with them and look for various things around the city, all the while building your friendships and relationships with the other members of the New York Combat Revue's Star Division, who, as it turns out, are all girls who you can eventually go out with. Yeah, it definitely feels like a harem anime at times. There is quite a bit of variation in Adventure mode. You will usually have some kind of goal or deadline, before which you should try and accomplish or find something. Outside of that, you will usually have a lot of leeway; you can do things as you see fit. You will have to make a lot of choices, and these come in the forms of multiple choice responses to questions or conversations. 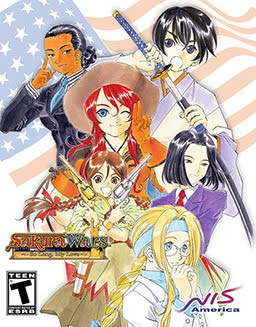 Sakura Wars uses the "LIPS" system, seen in many of the other games in the series. There are four types of the LIPS system, these consist of Normal LIPS, which is displayed when the player must make a decision in a certain time period. If you run out of time, you will get a hidden response(usually not a good one); Analog LIPS, which the player can raise the action gauge up or down depending on the situation ie. to shout if you raise the gauge, or speak quietly if you decrease the gauge; Double LIPS, which gives the player a longer amount of time to make important decisions; and Stick LIPS, where the player can manipulate the Analog Sticks to follow commands on screen and raise gauges depending on the situation. As you go through the game, your relationships between Shinji and the other characters grow for better or worse depending on the choices you take, and this is how your characters become stronger in battle. If you are getting on well with a certain character, they will get boosts to their stats in battle; do more damage, take less damage and so on. For me, that was quite an interesting idea in a strategy rpg-there is no grinding to keep up, instead it ties the Adventure mode and the Battle mode together really well. It also puts some degree of challenge into the game. If you screw up a lot of the questions, and this is fairly easy to do in some chapters, where it seems like you are supposed to fall out of favour with the character the chapter focuses on, then you will find it hard to keep that character alive in battle. One thing that frustrated me a lot was that when the character falls in battle, they dislike you even more. I could rage on the stupidness of that...sure I am in control of their actions, but it was their fault they didn't like me to begin with, so they hate me even more when they get themselves killed in battle? @#"%! off! Anway, it didn't really get to the stage that the characters hated me, there are always plenty of options to get them back on your good side. And I can see that they were trying to make the game a bit more tricky. The game is relatively easy once you get used to it. I actually died on the first battle, but after that I got used to it and didn't have many problems until one or two battles right at the end that I had to retry a few times. Graphically, this game isn't the best titles I've seen on the Wii, far from it. The only times that this really bugged me at all was during the battles, when it doesn't look particularly good in places. I mean, the graphics don't look terrible but they aren't exactly very standout either. They are kinda basic polygonal mechs with not the most detail in their designs, but hey, I wasn't that bothered about them. The graphics, while not the best, didn't particularly detract from my experience of the game. Some of the attacks in battle are nice and flashy, which is good. The character portraits are fairly well done for the most part. It does have some gorgeous anime cutscenes, there are a fair few more than a lot of other RPGs out there which only usually have one or two. Still, I would have liked more of these cutscenes. The soundtrack to this game fits well with what you would imagine 1920s New York to sound like, and is fairly consistent all the way throughout. Perhaps there are not quite enough tracks, but I thought some of the tracks felt a bit overused. I was starting to get sick of the same songs after a while, even though the game isn't particularly long. Little things like that can begin to grate on my nerves subconsciously for me, at least. The songs in there are fairly upbeat and catchy, with others that are a bit more serious during certain scenes. Kohei Tanaka's work on this game fits pretty well. This is a fun, light hearted game that is probably best enjoyed if you are a fan of anime, strategy rpgs, mechs and perhaps dating sims or visual novels. Its a bit of a mix of all of those things and the result is very Japanese and very enjoyable. It may seem on the short side at 20 or so hours, but there is a lot of replayability in there if you want to try and get all the endings. I think there is one for each of the main girls in the story. I'd recommend this Wii title, I liked what I saw of it. I'd give it a 8/10. The only reason I'd drop 2 marks would be for perhaps the shortcomings in the story and some of the areas feeling a little bland and lacking depth, ie. some battles.